Former GOP Delegate and gubernatorial candidate Ron George, who is running for State Senate in District 30, said on Facebook that “leftist Democrats” think businesses are “running sweat kitchens or slave plantations.” When challenged on his language by a reporter, he did not back down. This helps no one. Employees will take it. Why not? Currently, I do not question my employees when they call in sick. It is their decision if they are too sick to work or have a personal need. But the small business owners I know in other states that have this say it is felt it is owed to them (the employees) and suddenly the business owners are simply paying for people not working. Why are the leftist democrats always thinking business owners are running sweat kitchens or slave plantations. Most treat their employees like family. I am responsible for my employees providing for their families and I feel responsible to do well for them and they feel the responsibility to do well for the business. Most owners put in many extra hours because of our responsibility to our employees and work extra hours for them. It ain’t easy. George owns a jewelry store on Main Street in Annapolis. 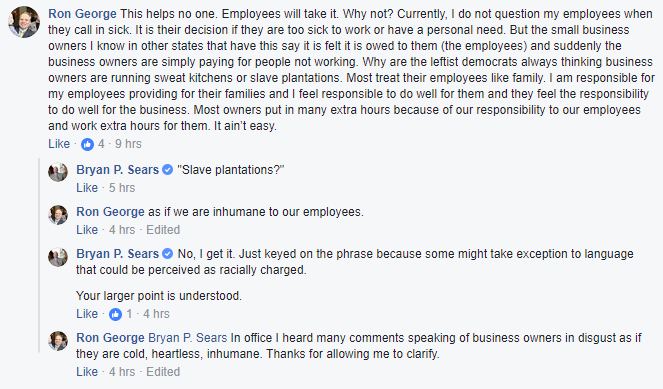 When Sears raised the possibility that George’s reference to “slave plantations” might be viewed by some as “racially charged,” George replied, “In office I heard many comments speaking of business owners in disgust as if they are cold, heartless, inhumane.” The full exchange appears below. We get that as a business owner, George may not particularly enjoy the government setting his workplace practices. But multiple polls find that huge majorities of Marylanders support paid sick leave. Even Governor Hogan has introduced not one but two sick leave bills. Are they all “leftist Democrats” who believe that business owners treat employees like slaves? Or is Ron George as out of touch with Marylanders as he is inclined to the use of racially charged rhetoric?